I just sold my first good bike. Not my first bike... those came and went. But my first non-department-store bike. It's a Gary Fisher Utopia. I bought it when I was heavy (220lbs or more) and out of shape. I sell it at 175lbs and in great shape! Money well spent. This bike changed cycling for me. Before it, there was endless frustration struggling with crappy gearing, uncomfortable positioning, squeaky brakes... it wasn't even fun to go out on those bikes. Gary was a joy to ride. And no, that's not what she said. 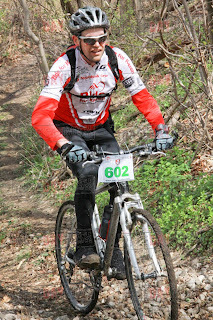 I went from doing the Ride for Heart (50km) to trying out the odd trail ride to doing the Tour de Creemore (65km), to racing my first real bike race (Paris to Ancaster) to trying out mountain biking on real trails in Durham Forest, all on this bike. I did my first 100km ride on it. Lots of memories and milestones. Then I bought a road bike for the asphalt, cyclocross for the in-between, and a mountain bike for the trails... and Gary just didn't have a role anymore. Sigh!